Reading and share top 7 famous quotes and sayings about Ouija Board by famous authors and people. Browse top 7 famous quotes and sayings about Ouija Board by most favorite authors. 1. 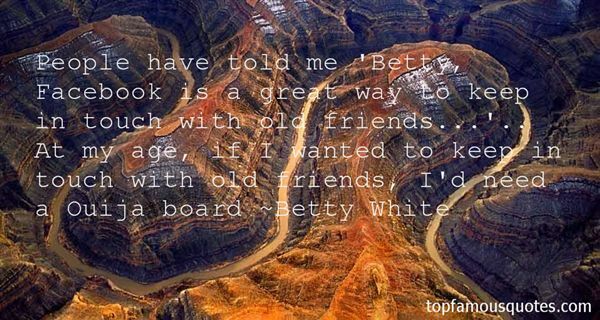 "People have told me 'Betty, Facebook is a great way to keep in touch with old friends...'.. At my age, if I wanted to keep in touch with old friends, I'd need a Ouija board"
2. "He held up his hands in surrender. "I'm not here to start trouble. I am just doing some research for my thesis. 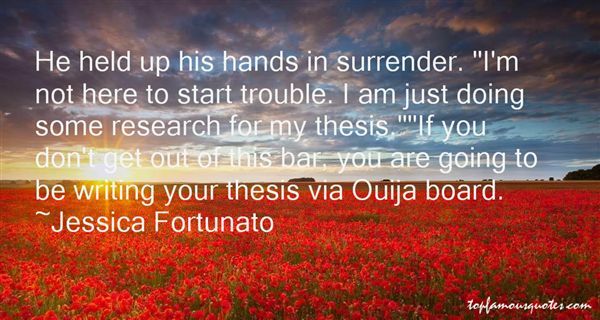 ""If you don't get out of this bar, you are going to be writing your thesis via Ouija board." 3. "Give me priests. Give me men with feathers in their hair, or tall domed hats, female oracles in caves, servants of the python, smoking weed and reading palms. A gypsy fortuneteller with a foot-peddle ouija board and a gold fish bowl for a crystal ball knows more about the world than many of the great thinkers of the West. Mumbling priests swinging stink cans on their chains and even witch doctors conjuring up curses with a well-buried elephant tooth have a better sense of their places in the world. They know this universe is brimming with magic, with life and riddles and ironies. They know that the world might eat them, and no encyclopedia could stop it"
4. "Ouija boards don't work. 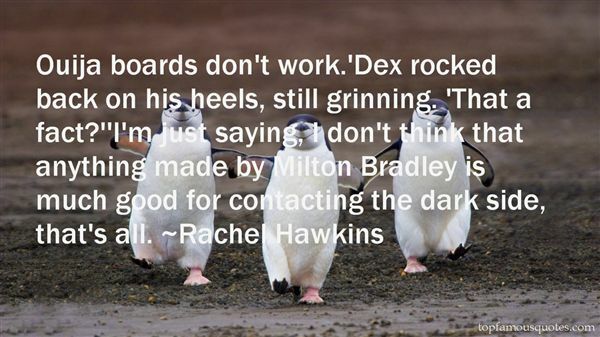 'Dex rocked back on his heels, still grinning. 'That a fact? ''I'm just saying, I don't think that anything made by Milton Bradley is much good for contacting the dark side, that's all." 5. "Learning shamanism from a book is like running with a razor sharp Ouija board." 6. "I love belief it can move the pallet on a Ouija board or put a man into space. The problem that we have is the wrong beliefs we can't erase." 7. "The obvious differences apart, Karl Marx was no more a reliable prophet than was the Reverend Jim Jones. Karl Marx was a genius, an uncannily resourceful manipulator of world history who shoved everything he knew, thought, and devised into a Ouija board from whose movements he decocted universal laws. He had his following, during the late phases of the Industrial Revolution. But he was discredited by historical experience longer ago than the Wizard of Oz: and still, great grown people sit around, declare themselves to be Marxists, and make excuses for Gulag and Afghanistan." The significance of our lives and our fragile planet is then determined only by our own wisdom and courage. We are the custodians of life's meaning. We long for a Parent to care for us, to forgive us our errors, to save us from our childish mistakes. But knowledge is preferable to ignorance. Better by far to embrace the hard truth than a reassuring fable. If we crave some cosmic purpose, then let us find ourselves a worthy goal."